STORM LAKE, Iowa – The No. 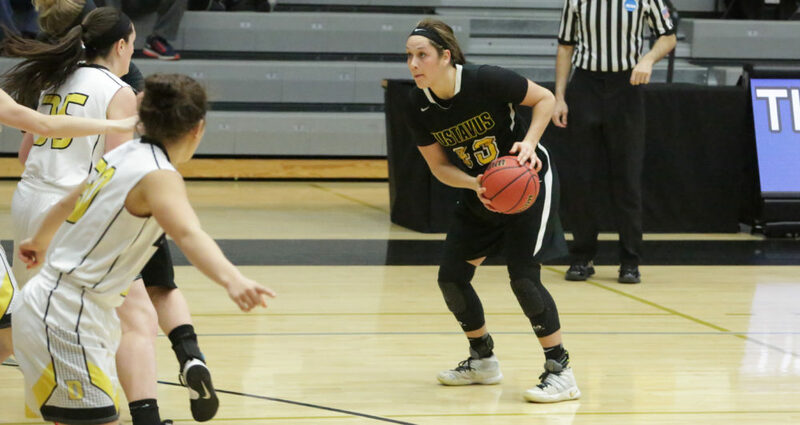 16 ranked Gustavus women’s basketball team started the season on the right foot Wednesday, defeating Buena Vista University 80-73. The Gusties erased a first half deficit and held off the Beavers down the stretch, making 7-of-8 free throws in the final 23 seconds of the game. Buena Vista took an early advantage, leading 19-7 after the first six minutes of play and held a 23-17 lead after the first quarter. The Beavers led 30-23 with 3:48 remaining in the first half, but the Gusties responded with an 11-2 run to end the second quarter and went into the break with a 34-32 lead. The Gusties shot 44.4 percent in the first 20 minutes, while the home squad was an efficient 64.3 percent from the floor. The third quarter featured a couple runs by each team with the Beavers taking a one-point lead before the Black and Gold answered with 12 unanswered points to gain a 52-41 lead with 2:11 remaining in the quarter. Gustavus carried a 56-51 lead into the final 10 minutes. The home team went on a 11-4 run late in the game to make the score 75-71 with 19 seconds left in the game, but the Gusties made seven of their final eight shots from the charity stripe to seal the victory. Miranda Rice (Sr., Forest Lake, Minn.) led the offense with 29 points on 13-of-21 shooting from the floor. She also led the team with eight rebounds. Kendall Thompson (Jr., Eden Prairie, Minn.) tallied a career-high 18 points and went 7-for-8 from the free throw line. Gustavus shot 48.4 percent from the field, and allowed the Beavers to shoot 46.9 percent. The Gusties out-rebounded the Beavers 41-32. Gustavus (1-0) hosts its home opener at 7:45 p.m. Tuesday against UW-La Crosse.